9 of Japan's leading animators were asked to create a short segment that followed the theme of "Robots," for their inclusion in this film. Essentially, this "movie" is 9 short films, all independant of one another. The common element is human interaction with robots, namely the consequences of creating life with one's own hands, played in nine very different ways. While simply a series of short films, Robot Carnival really is artisic creativity unbound. Each story in and of itself is an exploration into the various aspects of artifical life forms and various implications thereof. As written by Justin Sevrakis on ANN &quot;The show's credits reads like a whose-who of anime&quot;- and it truly does. I cannot recommend this enough for mecha fans and really anyone who enjoys seeing artists doing what they do best. Robot Carnival is a bunch of smaller pieces that forms a masterpiece. 30 years before Hollywood, Elon Musk, Bill Gates and Stephen hawking fear mongered the hell out of AI, these brilliant writers and animators theorize and demonstrate multiple short stories as how the AI/Robot singularity may playout, from beginnings, to present to future and post human worlds. These films each have their own theme and tone. You might up in deep thinking, dreading, laughing and crying in this one sitting. Enjoy these short films as they depict the struggles and joys AI/robots will face as they walk the same path as "us." I've spent over 30 years watching Anime...I started with Transformers and Robotech in the US. No matter what series I watch, no matter what movie I watch...Robot Carnival is the one that I will always compare them to. When I tell people, particularly those of the "newer" generation of anime fans, what Robot Carnival is about, I simply state, "This is, to me, the anime version of Walt Disney's Fantasia." I have loved this "movie" since the Sci-Fi channel first started in 2001. I wish that whoever holds the Copyright to this gets the stick out of their rear and allows this to be released on DVD/Blu-Ray in Region 1. I cannot recommend this enough. It is, and always will be, in my top 5 anime of all time. 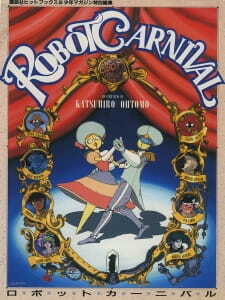 Robot Carnival an anime that before starting I was a little hesitant about. It wasn't the art work or age that worried me (I saw it a year back or so) but the fact that each episode was completely independent and that meant that while some episodes will be mediocre, some will be amazing however regardless, there is no story to look forward to. But then again each episode has a fresh feel to it, and since their length varies from 4 mins to approx 20 mins, we are not wasting too much time experimenting. However these conflicted views were before watching the anime. For Robot Carnival is a lucid experience that I would recommend to most people who don't have a stiff lip when it comes to different genres or old art work. As pointed out earlier each episode is a unique story however each has certain appeal for different viewers and I for one enjoyed almost all episodes. Some are simple single themed episodes with a not-so-deep yet appealing execution, others are deep, well expressed representations of humanity and its different aspects - others have both a side for normal viewers and thinkers alike (examples would be 2nd and 4th episode notably). The art is interesting - appealing in most instances though of course the fact that it is from 1987 should be kept in mind. We have various forms of character designs and sceneries. Different atmospheres can also be found through the series. The characters are like the story, some simple - others extremely complicated and some hard to judge. However that is the beauty of the series - its variety of themes and perspective. A unique aspect to this series is the fact that most of the episodes are silent - with music, but no dialogue but that actually adds to the experience. In a nutshell, I would recommend this to most people - yet I would specifically call out the older and more mature audience that can analyze various aspects of an anime.